Introduction: The aim of the present study was to investigate the incidence of cracks in root dentin after coronal flaring using various coronal preflaring instruments such as Gates Glidden drills (Mani, Japan), ProTaper Universal SX (Dentsply, Switzerland), K3 (Sybron Endo, USA), Endoflare (MicroMega, France). 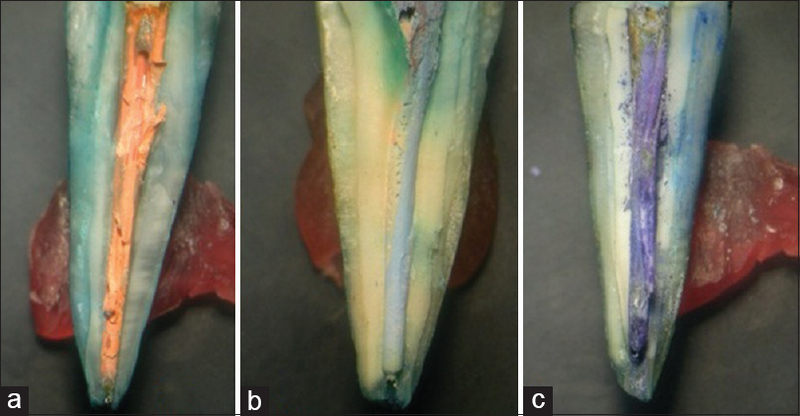 Materials and Methods: Fifty freshly extracted single-rooted teeth with single canal were collected. All the teeth were randomly divided into five groups of ten each, of which one group served as Control and rest of the four groups were instrumented with Gates Glidden drills, ProTaper Universal (SX), K3 instrument, and Endoflare, respectively. All roots were then sectioned perpendicular to the long axis at 1, 2, 3, 4, and 5 mm from the cementoenamel junction and examined under a stereomicroscope at 10 magnification. Any crack formations were recorded. The data were analyzed using Chi-square test. Results: The Gates Glidden drills resulted in a higher rate of crack formation in root dentin (P < 0.05) than the ProTaper Universal, Endoflare, and K3 instruments (P > 0.05) while preflaring of canal orifices. Conclusions: The use of the Gates Glidden drills resulted in more crack formation. However, the results for the ProTaper Universal, Endoflare, and K3 flaring instruments were less in terms of crack formation. Objective: The purpose of the present investigation was to analyze the effectiveness of using the EndoActivator™ (EA) system (DENTSPLY Tulsa Dental Specialties, Tulsa, OK) throughout the cleaning and shaping process to disinfect root canals contaminated with Candida albicans . Materials and Methods: Forty-six extracted human single-rooted teeth were selected. Except for those used as negative controls, the teeth were standardized and then infected with C. albicans . 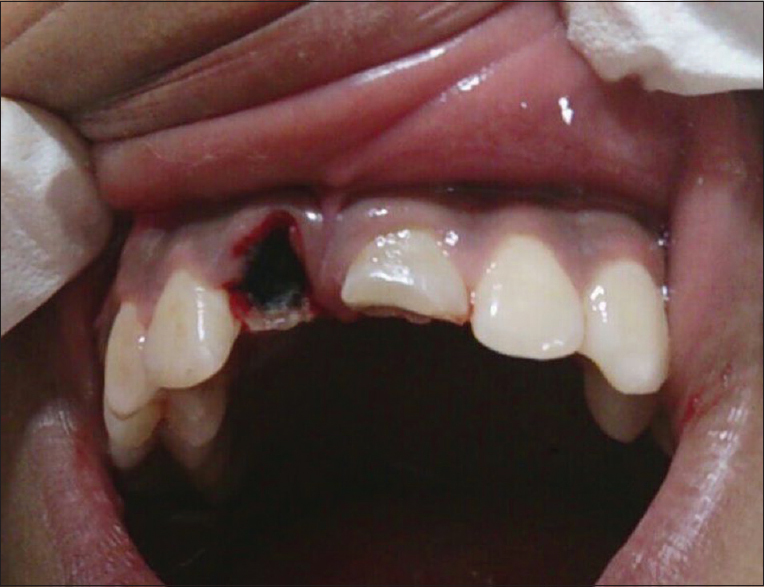 Infected teeth were randomly divided into four experimental irrigation protocol groups (n = 10); normal saline, normal saline with EA activation, 6% sodium hypochlorite (NaOCL), or 6% NaOCL with the EA activation. Three teeth were left untreated to serve as positive controls. Teeth not included in control groups were instrumented with ISO Profile rotary files (DENTSPLY-Tulsa Dental, York, PA). In groups that utilized the EA, the irrigant was activated throughout the procedure. Results: All samples of the positive control and saline groups showed C. albicans growth. The negative controls had no growth and NaOCL alone groups showed one sample growth. When the EA was used with NaOCL, three samples showed C. albicans growth. Conclusion: EA activation throughout the procedure did not add any benefit to disinfect root canal system against C. albicans . Aim: The aim of this study was to evaluate and compare the fracture resistance of simulated immature teeth rehabilitated with different restorative materials. Materials and Methods: A three-dimensional mathematical finite element analysis model was generated using a simulated immature maxillary central incisor. Five different models were generated representing Model 1 (control group): an immature tooth model without any reinforcement material; Model 2: Mineral trioxide aggregate (MTA) as apical plug (4 mm) + dual cure composite resin (till the access cavity); Model 3: Biodentine as apical plug (4 mm) + dual cure composite resin (till the access cavity); Model 4: Biodentine filled in the entire root canal (8.5 mm) + dual cure composite resin (till the access cavity); and Model 5: MTA filled in the entire root canal (8.5 mm) + dual cure composite resin (till the access cavity). A force of 100N was applied at an angle of 130° to the palatal surface of the tooth. 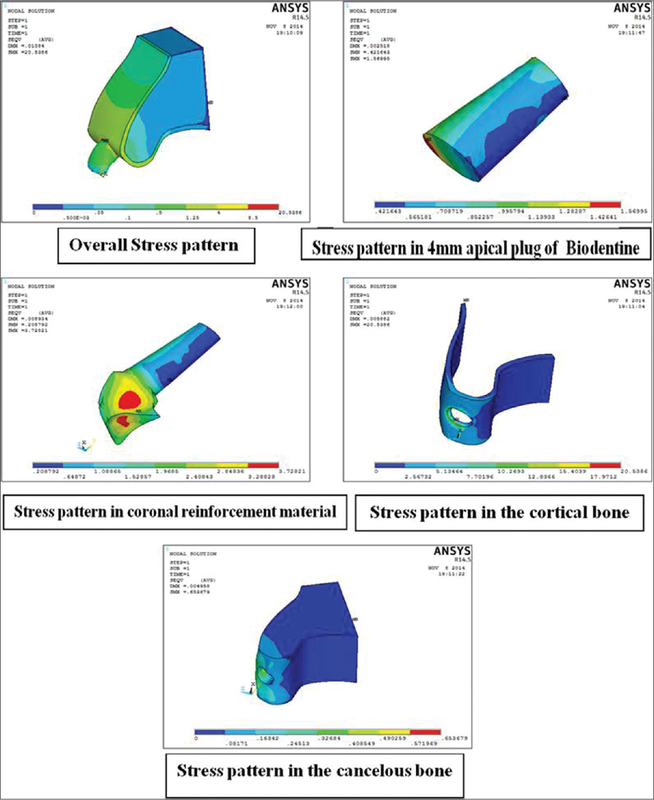 Stress distribution at cement-enamel junction was measured using the Von Mises stress criteria. Results: The highest stress development was seen in the Model 1 (control group). Model 3 showed higher fracture resistance as the stresses developed (when a 4 mm of apical plug of Biodentine reinforced with dual cure resin) were less followed by Model 2, 4, and 5. Conclusion: An apical plug of 4 mm Biodentine followed by intracanal rehabilitation with dual cure resin reinforces the immature tooth thereby increasing the fracture resistance. Aims and Objectives: To study the possible correlation of dentinal tubule penetration and microleakage by three root canal sealers: AH26, zinc oxide eugenol (ZOE), and mineral trioxide aggregate (MTA) using a dye leakage and scanning electron microscopy (SEM) methods. Materials and Methods: Fifty-one maxillary anterior teeth with completely formed apex divided into three groups. Root canals were enlarged till No. 60 K-file using step-back technique. Alternate 5.25% and 17% ethylenediaminetetraacetic acid irrigants were used and obturated with gutta-percha and one of the three sealers: MTA, AH26, and ZOE. The extent of leakage was determined under stereomicroscope after immersion in methylene blue and also observed the tubular penetration of sealer under SEM. Results: AH26 had lower microleakage scores than the other sealers, and MTA demonstrated the least penetration (P < 0.05). Conclusion: There was an inverse relationship between microleakage and tubular penetration of root canal sealers. Deeper the penetration, lesser is the leakage. Aim: To clinically compare the effectiveness of sodium fluoride and casein phosphopeptide-amorphous calcium phosphate (CPP-ACP) in reducing postoperative sensitivity associated with in-office vital tooth bleaching. 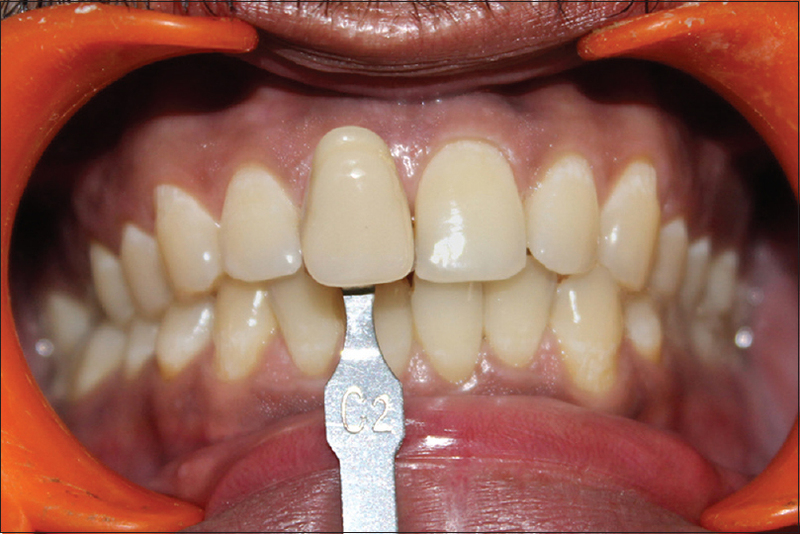 Materials and Methods: In-office vital tooth bleaching was performed on 45 patients using 40% hydrogen peroxide gel in a single visit. After the procedure, the patients were randomly divided into three study groups based on the use of desensitizing agent: Group 1 - experimental gel without desensitizing agent (n = 15), Group 2 - cream with 1.1% sodium fluoride (n = 15), and Group 3 - cream with 10% CPP-ACP (n = 15). Gel or cream assigned for each patient was applied directly on the labial surfaces of teeth and left undisturbed for 3 min. Furthermore, the patients were asked to apply the agent given to them for 3 min twice daily after brushing for 14 days. Follow-up was done on 3rd, 7th, and 14th day, at which time tooth shade changes was assessed using a value-oriented Vita classic shade guide. The incidence, duration, and intensity of tooth sensitivity experienced were self-assessed on a daily basis for the 14-day study period using a visual analog scale. Results: Significant higher incidence and intensity of tooth sensitivity was found in experimental gel without desensitizing agent in comparison to sodium fluoride and CPP-ACP groups. Significant decrease in Vita classic tab values was seen in experimental gel group after 14 days; however, in sodium fluoride group, tab change was not significant. Conclusion: Sodium fluoride and CPP-ACP both reduced incidence and intensity of tooth sensitivity after tooth bleaching. Sodium fluoride showed better shade stability than CPP-ACP; however, the difference was not significant. Aim: This study aimed to evaluate the smear layer removal efficacy of various herbal extracts, namely, green tea extract, orange oil, and neem leaf extract using the scanning electron microscopic analysis. Materials and Methods: The samples were divided into four groups having ten teeth each (n = 10); the groups were divided accordingly, Group A: sodium hypochlorite (control), Group B: green tea extract, Group C: orange oil, and Group D: neem leaf extract. Each tooth was then split longitudinally and was prepared for examination by scanning electron microscope under ×1500 and ×3000. Statistical Analysis: The smear layer removal scores were compared statistically within the groups using analysis of variance and Tukey's honest significant difference test (P < 0.05). Results: The canals treated with neem leaf extract exhibited significant smear layer removal when compared to those treated with orange oil, sodium hypochlorite, and green tea extract. Conclusion: The highest amount of smear layer removal efficacy was seen in the canals treated by neem leaf extract. Objective: The purpose of this study was to evaluate the effectiveness of different irrigation activation devices in removing debris from the isthmus area of mandibular molars. Materials and Methods: A total of 50 extracted human mandibular molars were selected, and access cavity was prepared. After determining the working length, instrumentation was done till ProTaper F2 with simultaneous irrigation with 5.25% NaOCl and 17% ethylenediaminetetraacetic acid. Later, the samples were divided into five groups containing ten samples each, that is, Endo-Irrigator Plus, EndoActivator, passive ultrasonic irrigation (PUI), manual dynamic activation (MDA), and control group. About 5.25% NaOCl was used for irrigation activation. Mesial roots were sectioned 4 mm from the apex and observed under a stereomicroscope at ×× 10 magnification for the presence of debris. Results: The Endo-Irrigator Plus demonstrated the least amount of debris followed by EndoActivator, PUI, MDA, and then control. There was statistically significant difference between the first three groups and MDI and control. However, there was no statistically significant difference between the first three groups. Conclusion: In this study, none of the devices were able to remove the debris completely. Nevertheless, Endo-Irrigator Plus, EndoActivator, and PUI could be used as effective irrigation activation devices. Introduction: The aim of this study was to investigate the relation between the distal wall thickness and length of the mesial root of mandibular first molars at different positions along the length of the root. Methods: Forty-five mandibular first molars were selected, and their lengths, from the tip of the mesiolingual cusp to the root apex, were recorded. The collected teeth were then divided into three groups according to their length: Group I – long (24.2 mm ± 1.8 mm), Group II – medium (21 mm ± 1.5 mm), and Group III – short (16.8 mm ± 1.8 mm). The mesial root of each tooth was marked at two levels – first at 2 mm below the furcation and second at the junction of the apical and middle third of the root. The thinnest portion of the distal root dentin of the buccal and lingual canals of the mesial roots was recorded. The distance between the buccal and lingual canals and the depth of concavity in the distal surface of the mesial roots were also measured. Results: Statistical analysis was performed using analysis of variance and the Student–Newman–Keuls test. The minimum thickness of the distal wall of the mesiobuccal canal was significantly different (P < 0.001) between Groups 1 (long) and 3 (short). Conclusions: Distal wall thickness of the mesiobuccal root and distal concavity of the mesial root of mandibular first molars were found to be thinner in longer teeth compared with shorter teeth. Aims: The aim and objective of this in vitro study was to evaluate the remaining novel hydrophilic and conventional hydrophobic obturating material on the walls of root canals after retreatment under scanning electron microscopy (SEM). Subjects and Methods: Sixty single-rooted human mandibular teeth were decoronated, prepared till F3 ProTaper (PTR) rotary files, and divided into three groups for obturation. Group 1 (control) – gutta-percha (GP) + AH Plus, Group 2 – C point + Smartpaste Bio, and Group 3 – GP + GuttaFlow 2. The teeth were retreated with PTR retreatment files and resin-based Endosolv R solvent. After final irrigation with 5 ml of 17% ethylenediaminetetraacetic acid followed by 5 ml of 5.25% sodium hypochlorite in all the samples, canals were dried using absorbent paper points and split into two halves using a diamond disk. The side of the root with the highest residual debris score was selected and each sample was divided into three equal parts as apical, middle, and coronal thirds. The samples were then evaluated using the SEM at ×1000 magnification. The data were tabulated and then subjected to statistical analysis using Kruskal–Wallis test and Mann–Whitney U-test (multiple comparisons). Results: Results showed that PTR universal retreatment files along with Endosolv R solvent did not produce completely clean canals in any of the groups. Group 2 (Smart-Seal system) was difficult to retrieve from the middle and apical thirds of the root canal walls as compared to the Group 1 and Group 3 (hydrophobic groups). Conclusion: None of the tested obturating systems could be completely removed from root canal walls however hydrophilic obturating system was difficult to retrieve as compared to hydrophobic system. Aim: The aim of the study was to determine the file system with best canal-centering ability (CA) and least canal transportation (CT) and which provides maximum resistance to vertical root fracture (VRF). Materials and Methods: Forty mesiobuccal roots of extracted maxillary molars were randomly divided into three experimental groups and one control group, with ten samples in each group. Group 1 samples were prepared with ProTaper file system, Group 2 samples were prepared with WaveOne single-file system, Group 3 samples were prepared with self-adjusting file (SAF) system, and Group 4 had no instrumentation. Pre- and post-instrumentation cone-beam computed tomography scans were done. CT and CA were evaluated at 3 mm, 6 mm, and 9 mm. Samples were subjected to load under Instron universal testing machine to determine VRF resistance. Data were analyzed using statistical analysis. Results: There was no statistical significance for CT, CA, and VRF resistance at all the three levels among the three groups; however, SAF system showed least CT and was more centered. Conclusion: SAFs produce less CT and more centered preparation compared to ProTaper file system and WaveOne file system. 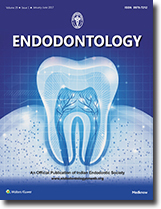 Aim: This study aims to evaluate and compare the efficacy of three rotary NiTi (ProTaper UR, R-Endo, and MTwo R) and one manual (Hedstrom file) instrument in the removal of a resin-based root canal obturation material (EndoRez) during root canal retreatment of curved root canals by area and volumetric analysis. 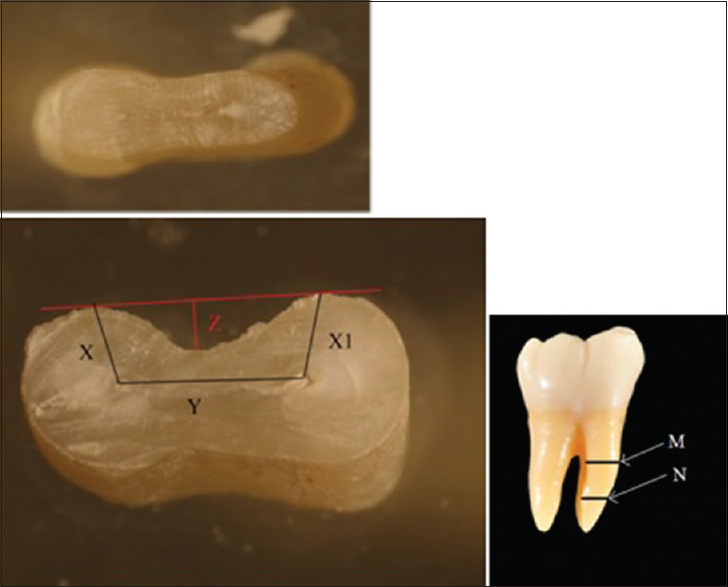 Methodology: Forty single-rooted curved (10°–30°) human mandibular premolars were decoronated to obtain a standardized working length. 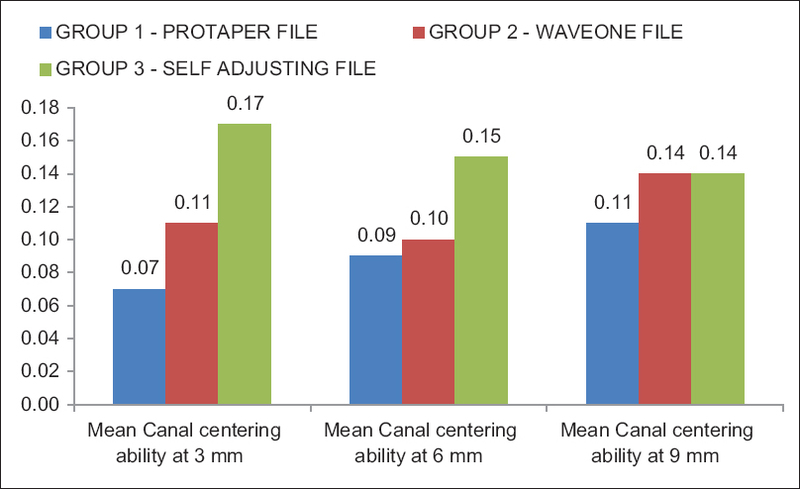 The canals were prepared using hand ProTaper instruments and obturated using EndoRez sealer and EndoRez Gutta-percha points. Pretreatment volume analysis of the obturation material was carried out using cone beam computed tomography (CBCT). Samples were divided into four groups (n = 10): Group I - Hedstrom files, Group II - ProTaper UR files, Group III - R-Endo files, and Group IV - MTwo R files. Total time required to attain the working length (T1) and complete removal of material with the last instrument used (T2) was recorded in seconds. Area and volume fractions of remaining filling were calculated in percentage using AUTOCAD 2000 software and CBCT. Statistical Analysis Used: The results were statistically analyzed using analysis of variance and post hoc tests (Tukey-HSD). Results: H-files took maximum amount of time for the entire retreatment procedure followed by ProTaper UR, R-Endo, and MTwo R with statistically significant difference. ProTaper UR files showed maximum cleaning efficiency (both in terms of area and volume of the remaining filling material) followed by R-Endo, MTwo R, and H-files with statistically significant difference. 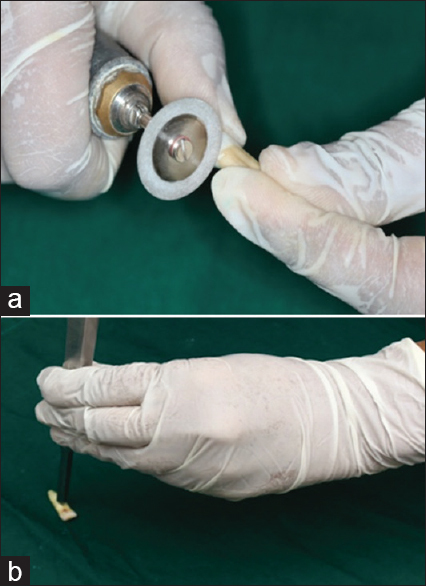 Conclusion: NiTi rotary instruments showed superior performance than hand instruments during retreatment. 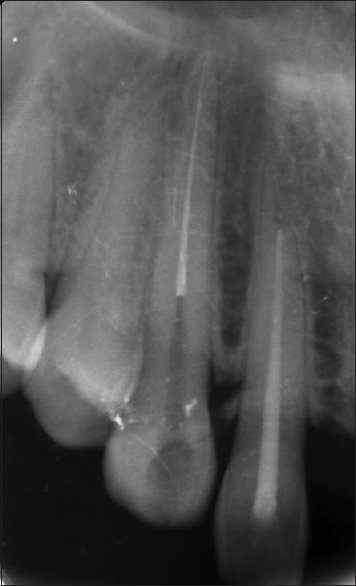 During routine endodontic therapy, a clinician may encounter many procedural errors and obstacles which may alter the course of treatment; one such error is instrument separation. A separated instrument prevents complete cleaning and shaping of the root canal and this might potentially influence the course of the treatment. Hence, every attempt must be made to retrieve the broken instrument. There are various instrument retrieval kits and chairside techniques available for this purpose. 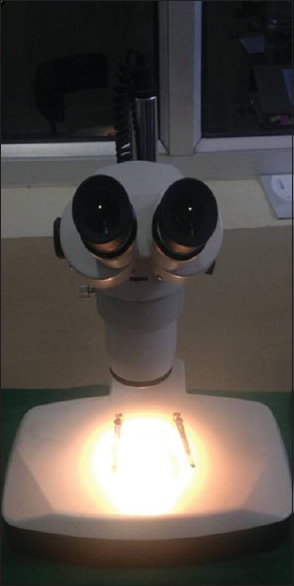 The present case report is about the successful retrieval of separated nickel-titanium rotary instrument with the help of ultrasonics and file braiding technique under surgical operating microscope. Occurrence of dens invaginatus in maxillary canine is rare. This article reports a case of maxillary left canine with type III dens invaginatus associated with periapical pathology, which was managed successfully by apicocurettage of apical pathology and root canal treatment of both the main canal and invagination separately. Wide open invagination as well as incompletely formed root apex was sealed with mineral trioxide aggregate (MTA) through retrograde approach and tooth was obturated with MTA to fill all the irregularities present in the invagination and the main canal. Foreign objects in the pulp chamber or root canal are not unusual findings in teeth undergoing root canal treatment or in root canal treated teeth. Detailed case history, clinical and radiographic examinations are necessary to come to a conclusion about the nature, size, and location of the foreign body. This kind of situation is more likely to occur in children due to their habit of placing foreign objects in the mouth. The foreign objects may act as a potential source of infection and may later lead to a painful condition. This case report describes a clinical case in which a screw embedded in the root canal of a fractured anterior tooth was removed through nonsurgical approach. Screw was retrieved followed by removal of old gutta-percha from the canal. Later, the apical third of the tooth was filled with mineral trioxide aggregate followed by post and core. Porcelain crown was placed with gingival margin of the crown replaced with pink porcelain. 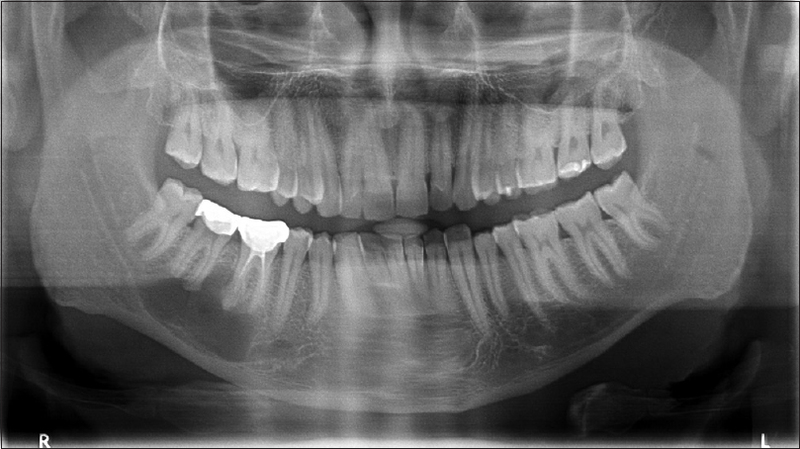 This article presents a case with a very large periapical lesion in relation to mandibular right first and second molars. A nonsurgical approach was taken into consideration for the management of the lesion. The treatment included nonsurgical root canal treatment with the aspiration of fluid through the root canal and placement of triple antibiotic paste for 2 weeks followed by metapex for 3 months. Complete periapical healing was observed at 2 years recall. This report suggests that surgical removal of the large periapical lesion is not mandatory and that irrespective of the size of the lesion, every effort should be made to treat such lesion by conservative means. C-shaped root canal configuration is an aberration of normal root canal anatomy whereby the main anatomic feature is the presence of a fin or web connecting the individual root canals. The incidence of the presence of such C-shaped root canal is extremely rare in the case of mandibular second premolars. 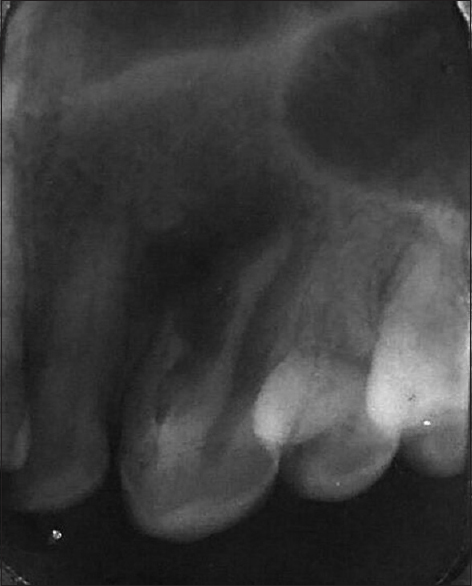 Such canal configuration poses a challenge to the clinician during cleaning, shaping, and obturation of root canal. 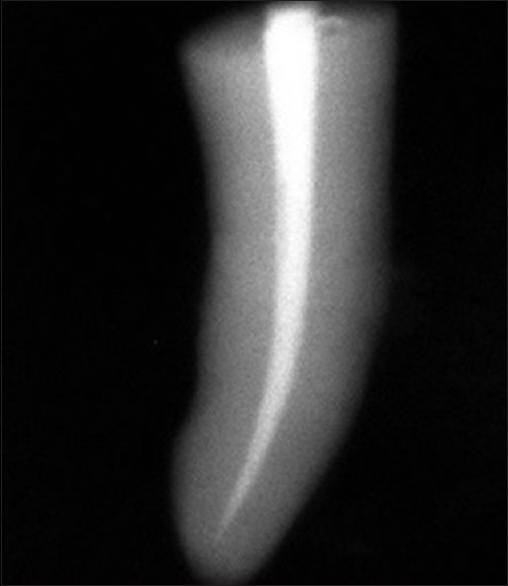 This case, reports a rare finding of C-shaped root canal in mandibular second premolar, confirmed taking cone-beam computed tomography and under dental operating microscope. Furthermore, it addresses clinical techniques used against challenges in endodontic disinfection of the C-shaped root canal and its meticulous endodontic management.